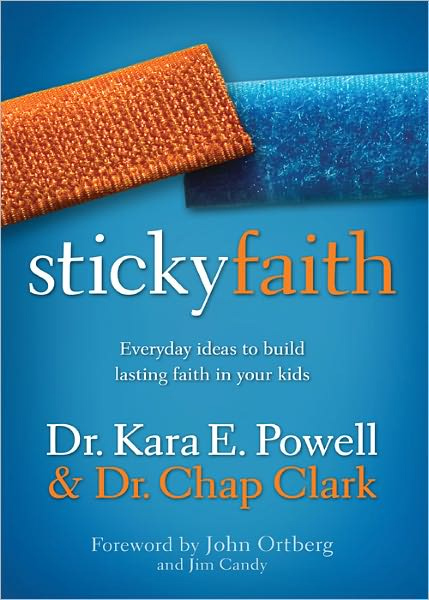 A few weeks ago I got a shiny blue package in the mail from Zondervan Publishing House containing a prepublication copy of Sticky Faith, the new book for parents by Kara Powell and Chap Clark. The book has a catchy title and from the looks of the fancy packaging, it’s going to be marketed pretty well by the publisher. That’s a good thing if you’re an author! I was eager to read my copy of Sticky Faith not only because it’s a topic I’m interested in, but because of who wrote it. My package included a nice personal note from Kara who I’m proud to say was a very bright student of mine when I was teaching youth ministry classes at Bethel Seminary in San Diego about 15 years ago. She went on to Fuller Seminary, got her PhD and now heads up the Fuller Youth Institute. There’s no question that she has become one of this generation’s most respected youth ministry voices. Chap and I go back a long way, having worked together for many years at Youth Specialties. He also teaches at Fuller Seminary and his 2004 book Hurt has established him as one of the leading authorities on adolescent culture. Simply put, Sticky Faith is a book for parents on how to pass lasting faith on to their kids. It’s not the first on this subject of course. (Ahem, now would be a good time to plug my book Generation to Generation, right?) There are quite a few good books coming out these days to help parents raise their children up in the faith. The unique spin that Powell and Clark give this topic is found in the word “sticky.” They express concern, as we all do, that faith just doesn’t seem to “stick” with kids who populate our youth groups. “Our conclusion is that 40 to 50 percent of kids who graduate from a church or youth group will fail to stick with their faith in college.” Some researchers have put this percentage a lot higher (anywhere from 65 to 80 percent) but Powell and Clark, while being a bit more optimistic, make it clear that “a 50 percent rate of Sticky Faith” is unacceptable. I found their chapter titled “A Sticky Web of Relationships” to be especially good and affirming in my current ministry (Pastor to Generations at College Avenue Baptist Church in San Diego.) For the past couple of years, besides working with parents I’ve been trying to help our church take some baby steps towards becoming an intergenerational church, which is what this chapter is all about. Powell and Clark write about the importance of connecting kids with ordinary adults in the church (not just the trained youth workers) and creating what they call 5:1 (a reverse in the typical ratio of adults to kids in the church). I’ve advocated something along those same lines for many years. In my mind, the first youth group in history was the one found in Luke 2:46. That verse pictures Jesus as a 12 year old, sitting in the temple with a group of elders (“teachers” in the NIV). Rather than a bunch of kids with one adult in charge, here we have one kid with a bunch of adults. I’m not sure how many elders were actually there with Jesus at the time, but I do know he had more than one overworked, underpaid youth worker. We don’t have the teenagers preaching sermons yet, but our pastor frequently uses them as sermon illustrations. Intergenerational churches are not new of course. What’s new is that churches over the past 50 years have intentionally and regularly segregated kids from the rest of the church. “And that segregation is causing kids to shelve their faith,” say Powell and Clark. Not the only reason, perhaps, but certainly a contributing factor. I suppose my only nit-picky criticism of the book would be the authors’ overuse of the word sticky—sticky findings, sticky identity, sticky Gospel, sticky justice, and so on throughout the book. The book started to even feel sticky. No wait, I think that happened after our 5-year-old grandson Jack used the book as a placemat. Still, this is a good book, one that I’ll definitely be recommending to parents and youth workers. This entry was posted in Ministry, Parenting and tagged Chap Clark, Generation to Generation, Kara Powell, Parenting, Sticky Faith. Bookmark the permalink.